Every year at low Drag circuits some teams will try a more radical way to reduce downforce and drag from their rear wing. It’s rare these solutions get to race, as teams invariable end up running more downforce than the barest minimum these special wings provide. 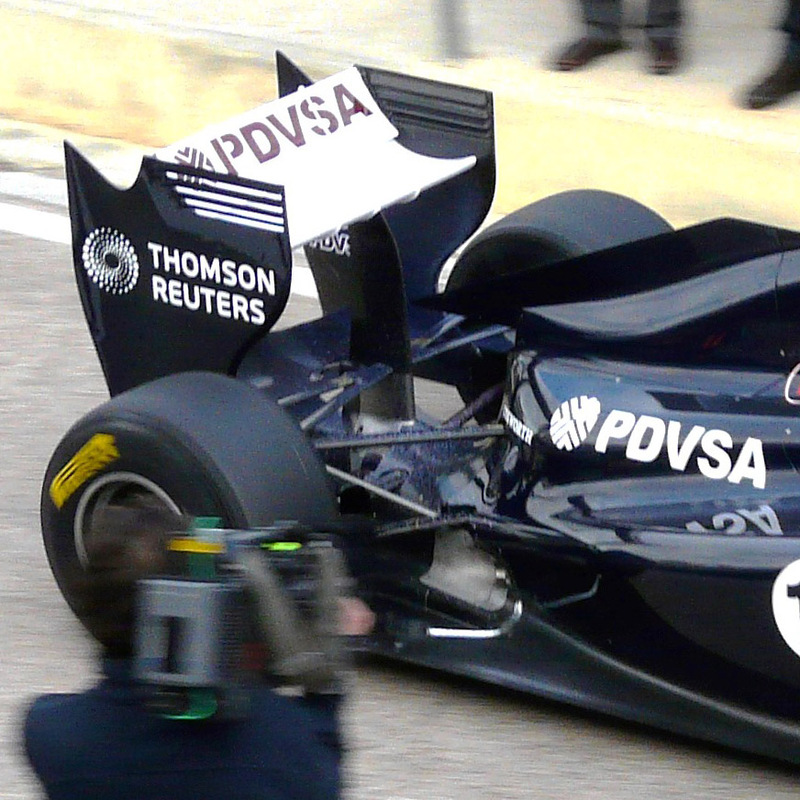 This year Williams bucked that trend and have an all new low drag rear wing. 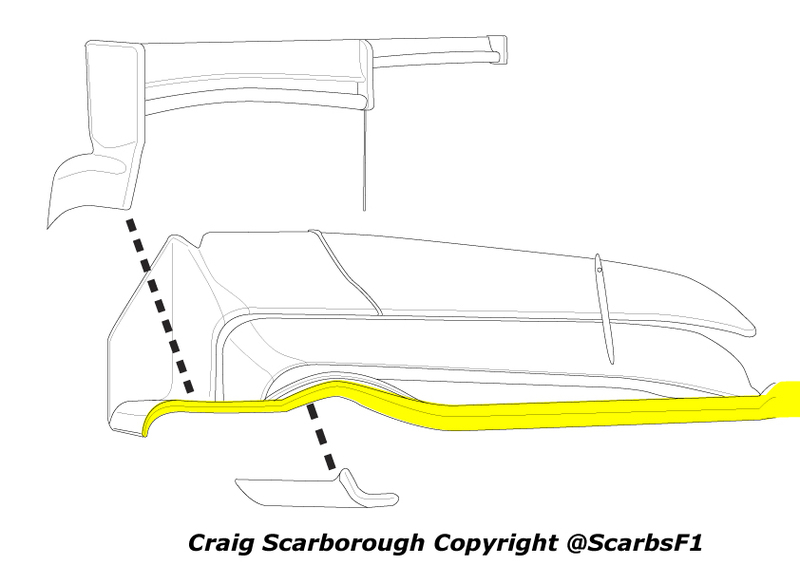 Williams have gone for an opposite strategy to last years (https://scarbsf1.wordpress.com/2011/06/11/renault-wiliams-complex-low-drag-wings-for-canada/) and have created the wings downforce towards the tips of the wing and not the centre. Both Williams and Renault had complex wings for the low drag demands of the Canadian GP. In Williams case the wing is shaped to create most downforce in its centre, leaving a much shallower span near the endplates. This design reduces the pressure difference where the wing meets the endplate. This reduces the vortices produced at the wing tip and hence drag. 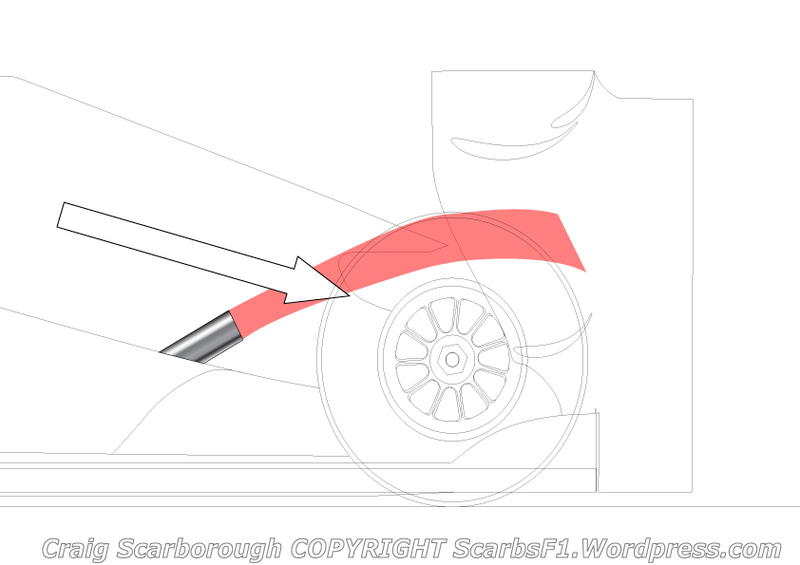 Although the Williams wing is fitted with DRS, low drag is still critical as DRS can only be used in the race in the situation where the car is less than 1s behind another at the DRS detection zone. 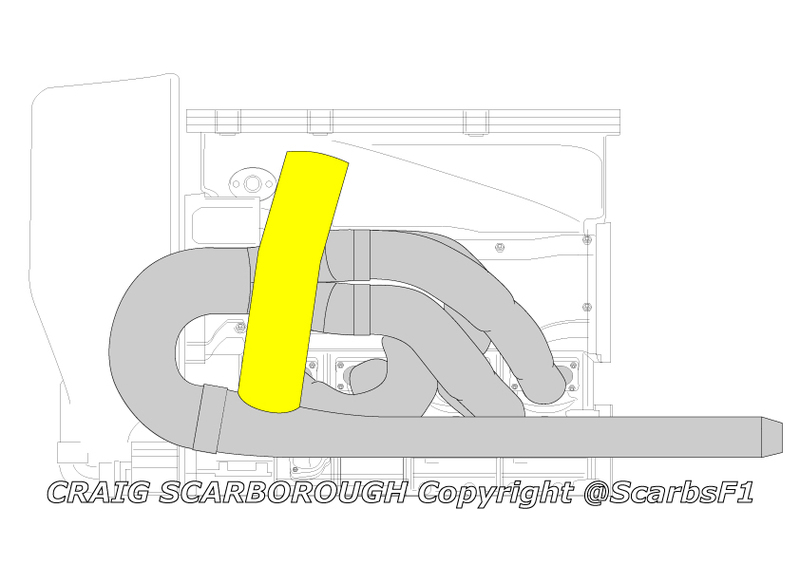 Renault meanwhile have twisted their rear profile to match the oncoming airflow. This is in fact an old wing already seen in 2010. 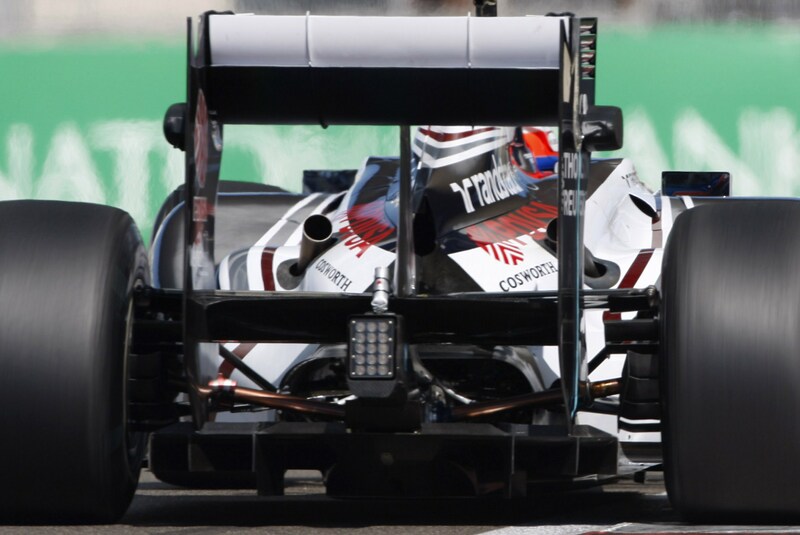 Williams introduced a new concept of front wing for Canada. Working along similar geometry for the three wing elements, the endplate design has evolved to be formed totally by the wings main plane. In order to meet the rules of side profile surface area, the wing sports a vane that also mounts the cascade. While sealing the airflow beneath the wing, a function normally served by the endplate is formed by a small fence added below the main plane. 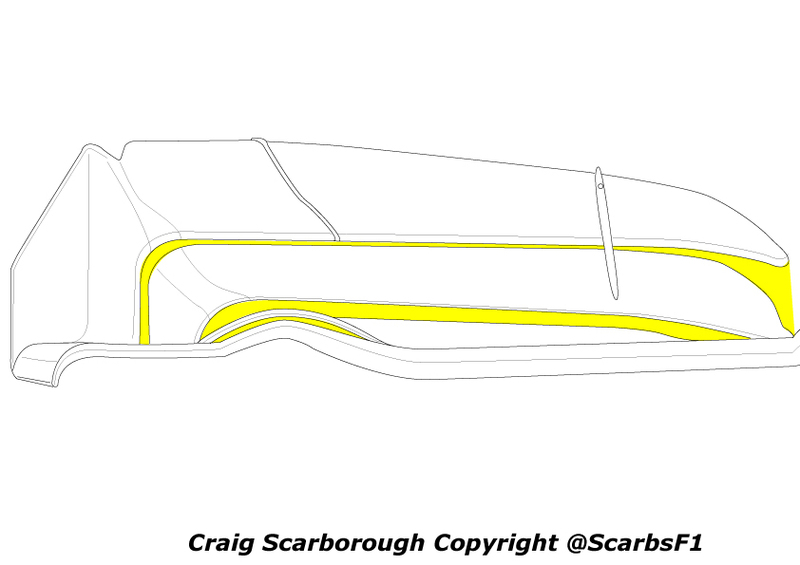 With the cascade and under-fence removed you can see the line of the main plane (yellow) forms a continuous curve across its entire length, no separate parts form the end plate. 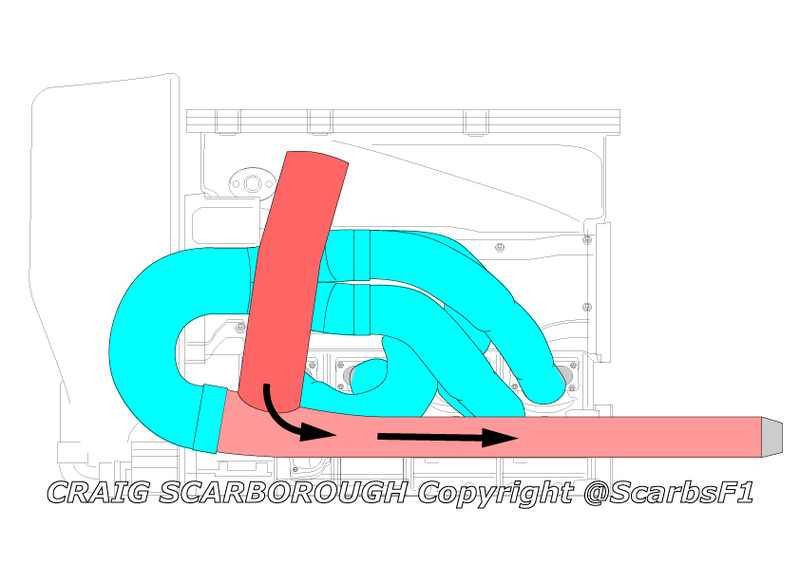 You can also see the two flaps curve down to form the rest of the ‘endplate’ function. 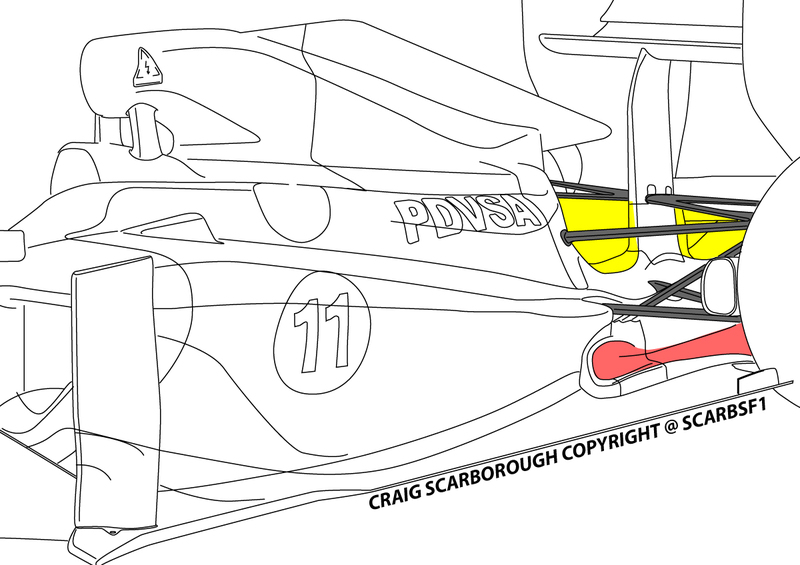 Lastly the wing continues to exploit a solution used by Williams all season. The wing is notionally a three element design, with a main plane and two flaps. However an extra slot is formed in the outer span of the main plane and this formed effectively a four element for more highly loaded outer section. You can see the depth and length of the wing in this outer is greater than the other sections of wing, so this area creates the highest amount of downforce. Having been obvious at its launch the Williams FW33 has a radical shrunken gearbox case. 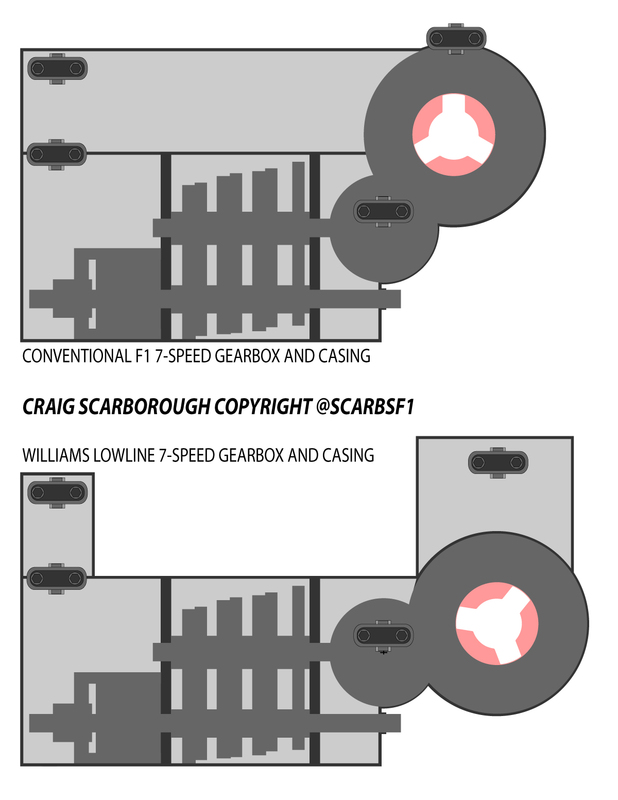 Now we can see how the case is actually configured, which is close to the diagram I posted back in February (https://scarbsf1.wordpress.com/2011/02/10/williams-fw33-lowline-gearbox/). As I explained Williams sought to remove as much blockage ahead of the beam wing as possible, to do this they lowered the top of the gearbox, switched to a Pull-Rod set up and repositioned the differential much lower. The revised layout has lead to a very neat gearcase. To get a reference point for what we see in this picture, it’s the lower wishbone that’s fitted. This is usually mounted halfway down the gearcase and the top wishbone mounts above it. So what we are seeing is the casing dropping downwards from its front face to create a low flat top. It’s this front face that also gives an idea of how high a conventional gearcase is. 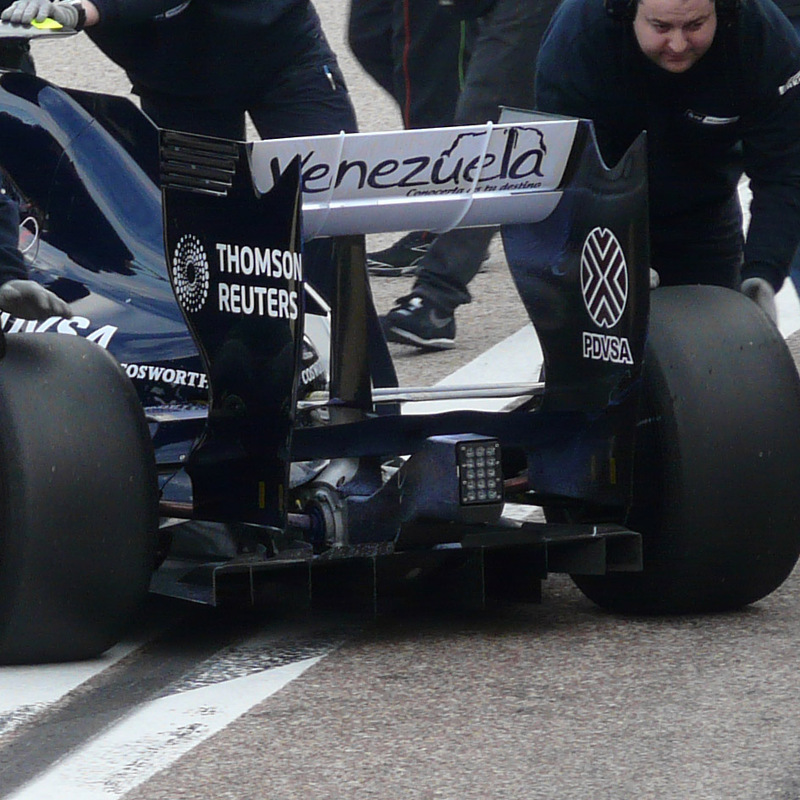 So clearly Williams have lowered the case dramatically (see below). Equally the differential (the diff’ circled above) is very low too, normally its several centimeters above the lower wishbone, now the diff’ is below the wishbone. This is why when we see the car from behind; we can see the driveshaft’s angle upwards from the gearbox at an extreme angle. Above the diff’ is the bolt on wing mount, as explained in my previous article, this metal structure supports both the rear wing and the top wishbone. One curiosity of the diff’ and wing mount set up is how the diff’ is removed. Normally the gearcase is split to allow the differential to be removed from the back of the case. 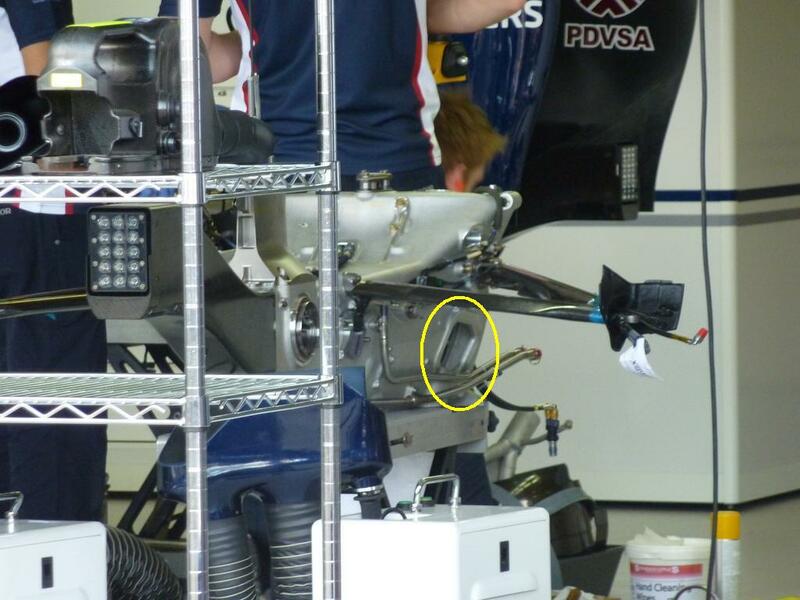 Perhaps with the new Williams set up, the case has a cover over the left hand side of the differential and the diff’ is removed sideways. This set up would create a slightly stiffer case, critical for its complex waisted shape. Williams have also switched to a pullrod suspension, this places the rocker linkage and the dampers low down at the front of the gearbox. The dampers heave spring and inerter have to pass horizontally across the front of the gearbox; they enter the gear case via the aperture seen at its lower front side. Williams have a unique rear end set up, with the rear wishbone and rear wing mounting to the same pylon. In early tests other drivers and media suggested the rear wing moving laterally and this was related to the lack of stiffness in this pylon. However Sam Michael has refuted these claims and looking at the rear wing set up, you can see where the movement came from. Due to its low gearbox casing, the rear leg of the top rear wishbone mounts to a vertical metal extension of the gearbox. The structure then continues vertically in the form of a carbon fibre strut, which mounts the top rear wing. 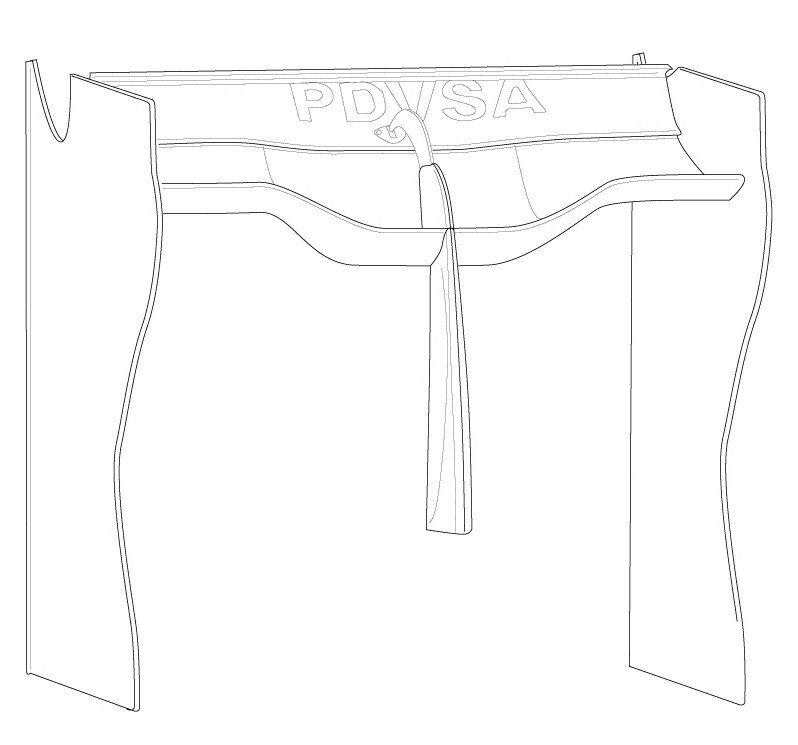 Normally teams will also support the beam wing with sizeable mount to the top of the rear impact structure. As part of Williams ‘waisted’ approach to structures at the back of the car, the beam wing ‘floats’ above the impact structure. 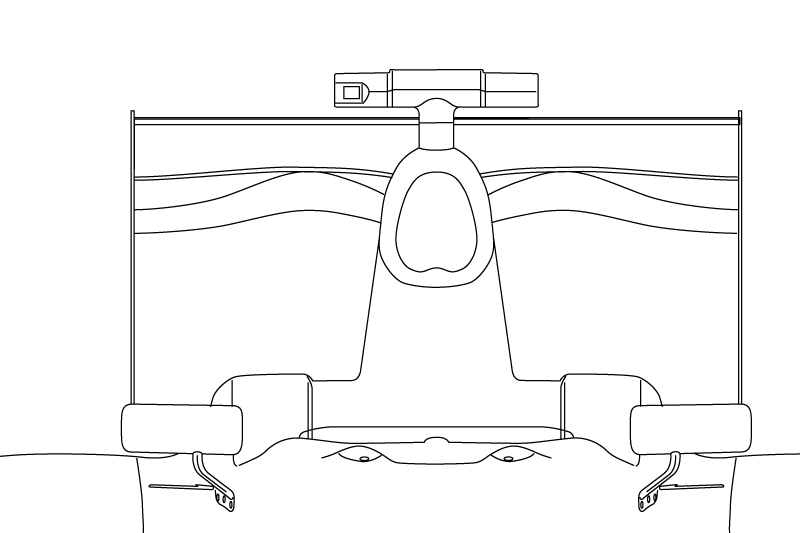 Thus aero loads from this device pass upwards through the endplates into the top rear wing and consequently into the vertical pylon back to the chassis. In early tests the endplates were not able resist the lateral loads the beam wing exerted on the assembly and as a result the lower of the wing moved laterally. 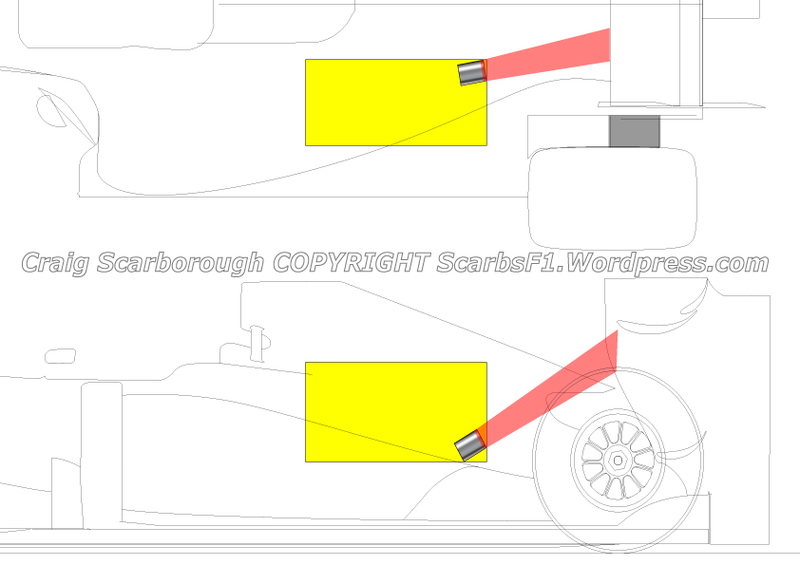 Williams had already accounted for this with a small metal stay (illustrated – yellow) between the vertical pylon and the beam wing. Such were the cornering loads around Valencia, this was unable to steady the wing. So Williams added links from the endplate to the diffuser. This greatly reduced the movement and no negative comments have merged about the structure around the back of the car since. Williams said their new car would be aggressive, but at first look the FW33 seemed quite conventional. Until the area above the gearbox is looked at. 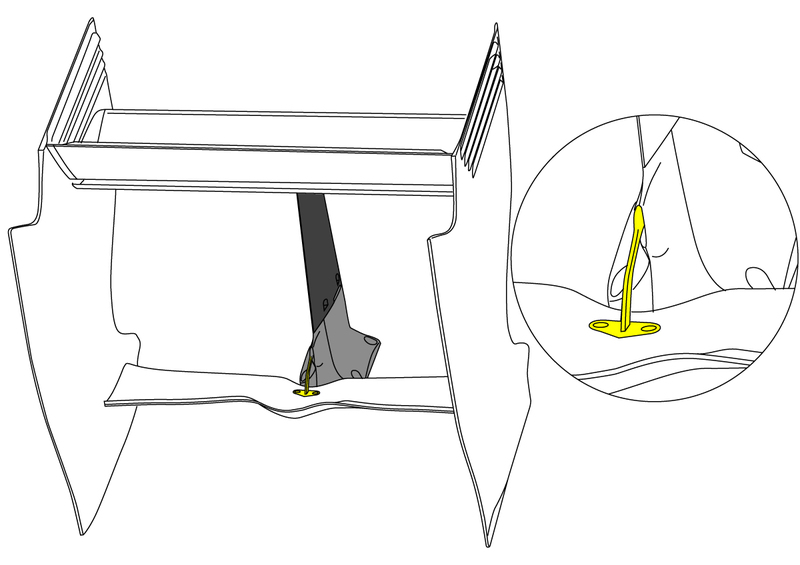 In order to gain the maximum flow towards the lower beam wing, Williams have removed a large part of the gearbox case (as described in the below illustration shaded yellow) ,lowered the differential and reworked the rear suspension. In fact Williams Design team have completely rethought the rear suspension and gear case. 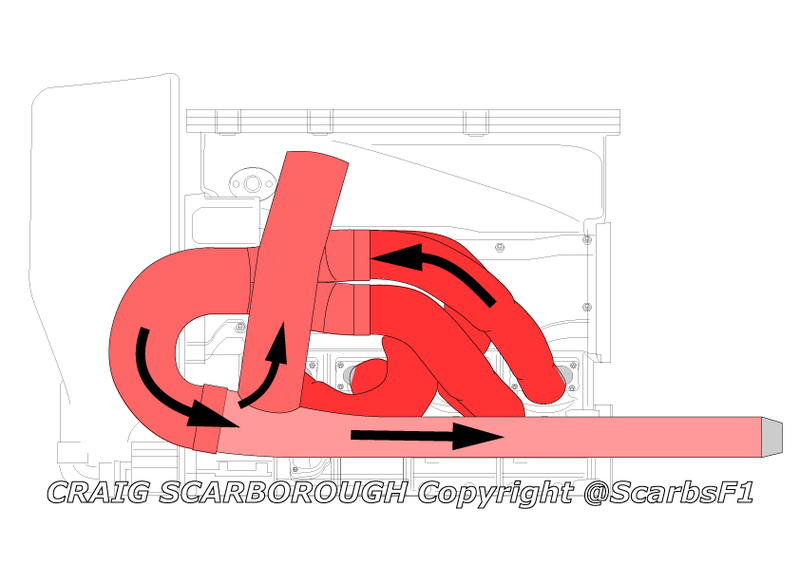 By going to a Pullrod set up, the rockers, torsion bars and dampers that normally occupy the space above the gearbox are sited low down at the side of the gearbox (see https://scarbsf1.wordpress.com/2010/10/10/red-bull-pull-rod-suspension-what-is-looks-like-how-it-benefits-aerodynamics/). Without this hardware mounted so high up, the area above the gearbox is just a void. So although it serves a structural purpose the stiffen the suspension mounting points. If they can be sufficiently stiff, then this area can be removed. 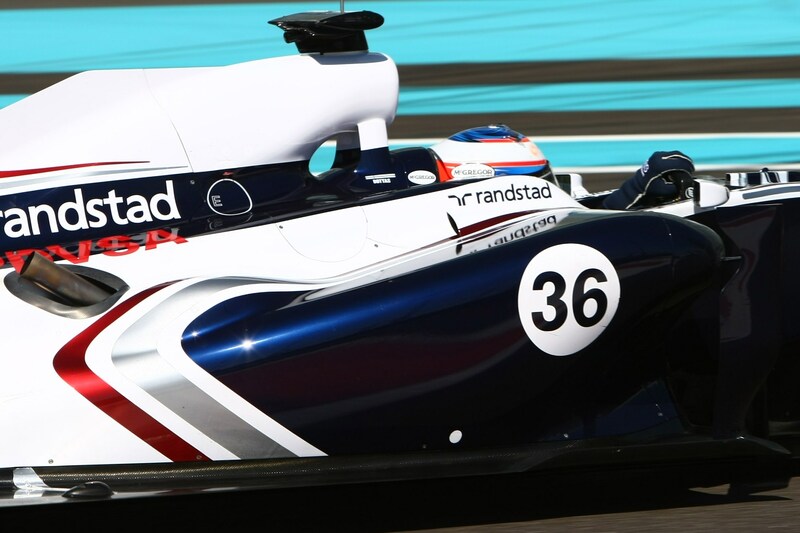 Thus with the Williams the air flows over the upper body and around the engine cover, the bodywork then curves in behind the engine and airbox in a sharp “V”. 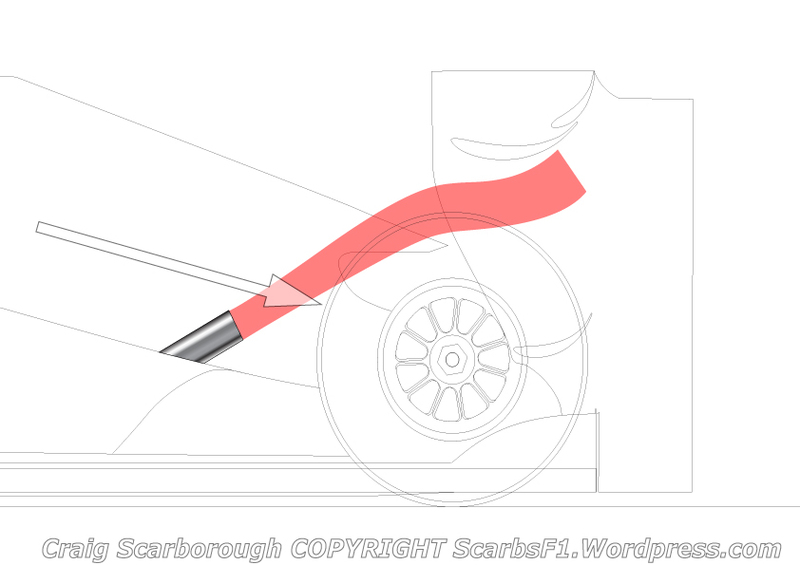 There is then no structure to hinder the airflow, until the air passes around the rear wing support, which now doubles up as the top rear wishbone mounting. To remove other elements in the air steam, Williams have removed the toe link from behind the driveshaft and replaced it with a “Z” link upper wishbone. The slim carbon fibre moulding acting as both suspension members. Further lowering the rear end the differential is lowered as far as possible. The differential is driven from the cross shaft between the diff and the main gear cluster. The differential can effectively be at any angle pivoted around the centreline of the cross shaft. What Williams have done is to lower it as far as possible while still allowing the CV joints some consideration and the starter shaft to be accessed. This does effectively make the gearbox slightly longer. One fear from the outsiders point of view would be the structural efficiency of such a waisted design, especially the vertical spar, that supports the wishbones leg above the differential. 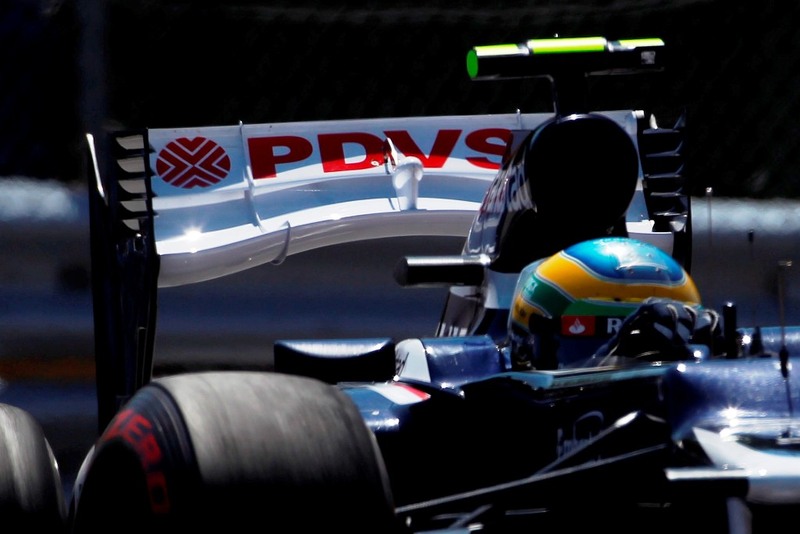 Williams would either have to compromise weight or stiffness to make the design efficient. So despite the loss of a large proportion of the gear case, the gain may be offset by the penalty of added weight to make the remaining structure stiff enough. This gearbox has been a long lead time project, Sam Michael told me the new case was planned as early as March last year and the hard worked CV joints and driveshafts are designed and made by Pankl. They have no worries about the set ups reliability, although the joints are installed with such an extreme angularity, that they would either rob power or reliability with a normal design joint. So complex is this set up, it would be near impossible to copy during the season. 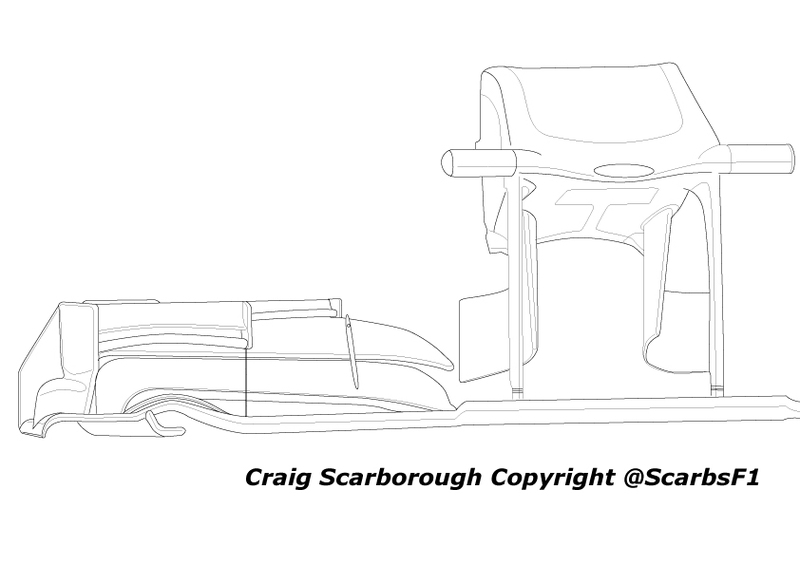 As this would require new rear crash structures which are now homologated. Not to mention the lead time and cost involved in developing a new gearcase and driveshaft solution.